What animal was here? Can you solve the mystery? Study the picture and read the clues to figure out who left each set of tracks. Then turn the page to find out about animals from around the world. Watercolor and collage illustrations show the many kinds of trails that animal leave behind in mud, snow, and sand. Mia Posada grew up in Minneapolis, then studied art at the University of Wisconsin-Madison. After graduating, she moved to the San Francisco Bay Area where she lived until 2007 when she moved back to Minneapolis with her husband and children. Mia has written and illustrated five books: Dandelions: Stars in the Grass, Ladybugs: Red, Fiery and Bright, Robins: Songbirds of Spring, Guess What is Growing Inside This Egg, and Who Was Here? 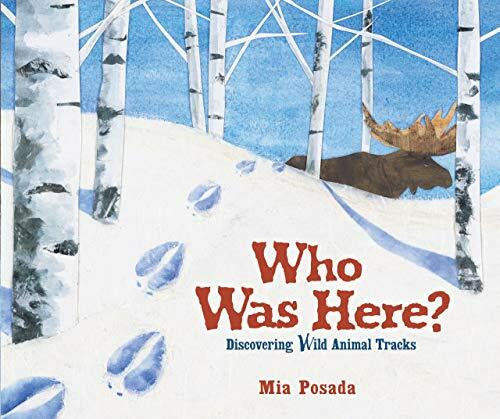 : Discovering Wild Animal Tracks. She also illustrated Dazzling Dragonflies by Linda Glaser. Published by Millbrook Press ?